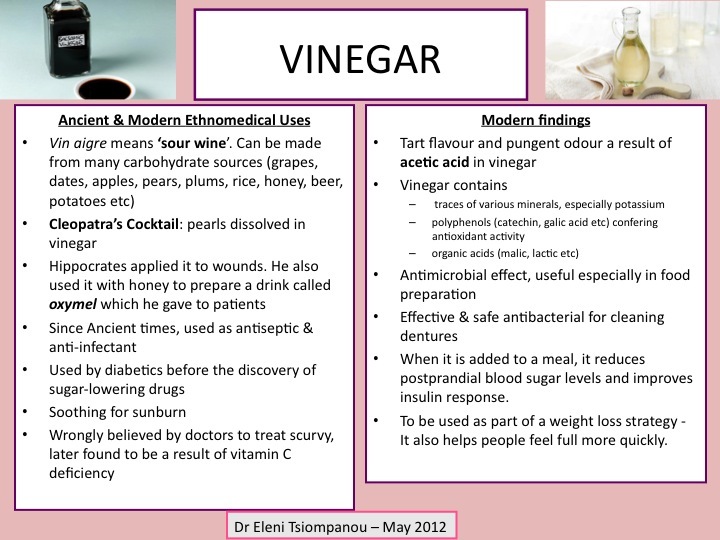 Vinegar in salad dressings and food products can be used as part of a healthy diet. it improves the insulin response to a meal. This means that insulin is released in the bloodstream in more steady quantities, not in boosts as when we eat a meal that is full of sugar and other carbohydrates. When the body is exposed repeatedly to high levels of insulin, cells became less sensitive to it over time and this increases the risk of diabetes. Therefore, vinegar can help lower the risk of insulin resistance. In Mediterranean countries, the custom of offering pickles at the beginning of a meal and including vinegar in most salad dressings and sometimes in cooking, is a very healthy attitude. If “food is medicine”, why not prescribe it?